When you're on vacation, your room is your sanctuary. Part of the reason my family loves staying at the Disney World resorts is because the rooms are so packed with details and cozy corners that you almost never want to leave them! 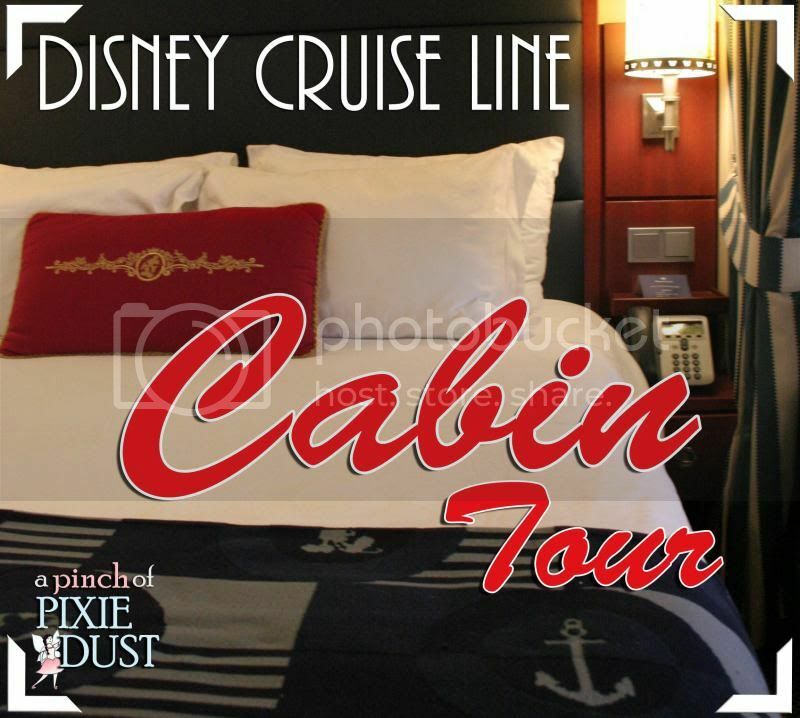 We shouldn't even call it a room tour: it's a CABIN tour on the Disney Cruise Line! 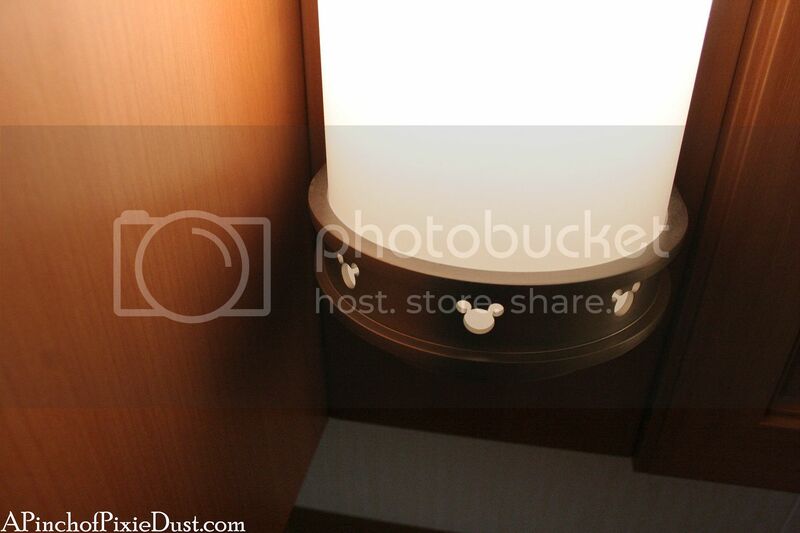 There are a variety of stateroom categories on the Disney Dream. My Dad really didn't the idea of a balcony where someone could tumble over the railing - not that you would of course, but I can't really blame him. 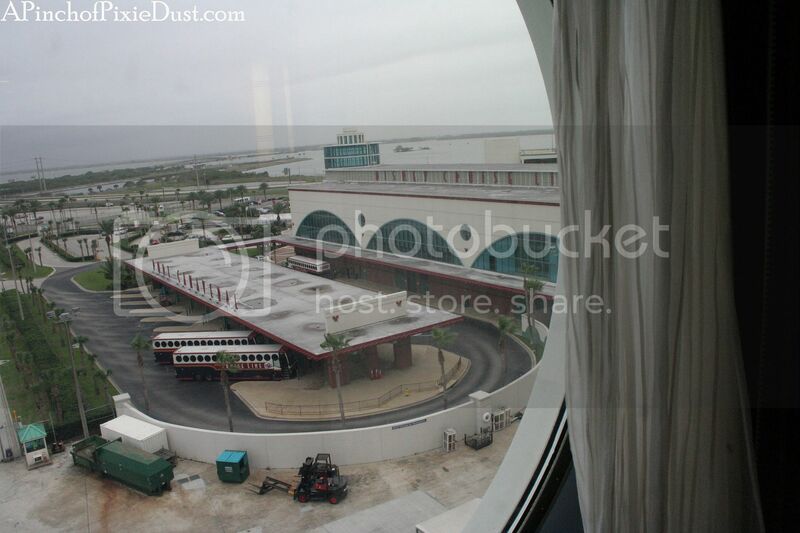 If you don't want a verandah, you can still have an oceanview room with a porthole or an inside stateroom with no window but a "magical" porthole that shows video of the outside of the ship with some Disney characters animations that occasionally appear. 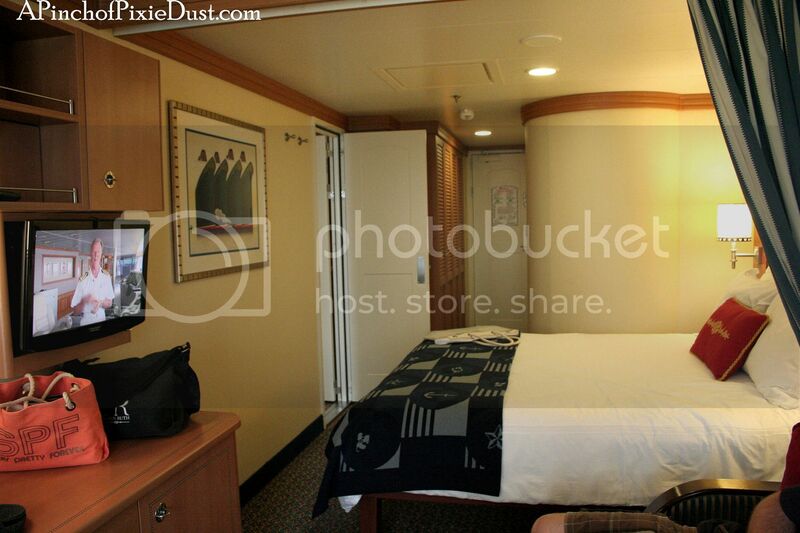 That does sound pretty fun, but we wanted the real view - this post is all about a Deluxe Family Oceanview Stateroom. 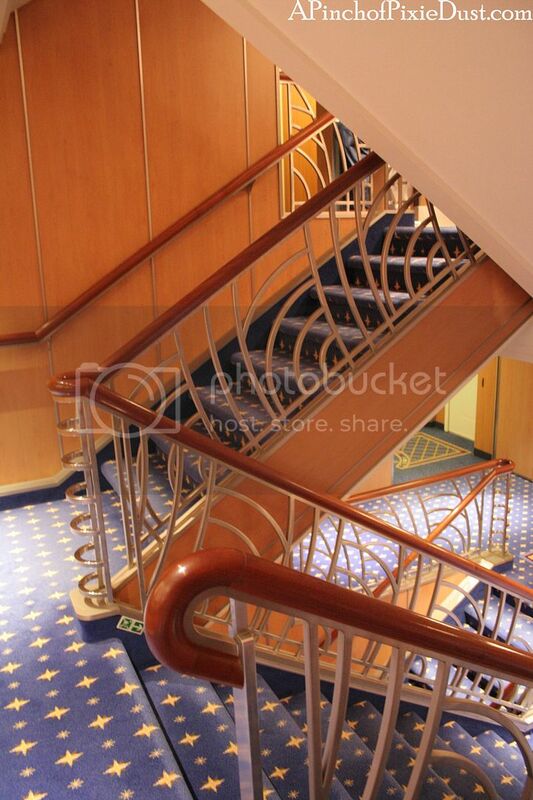 Shall we head up the stairs and find our cabin? 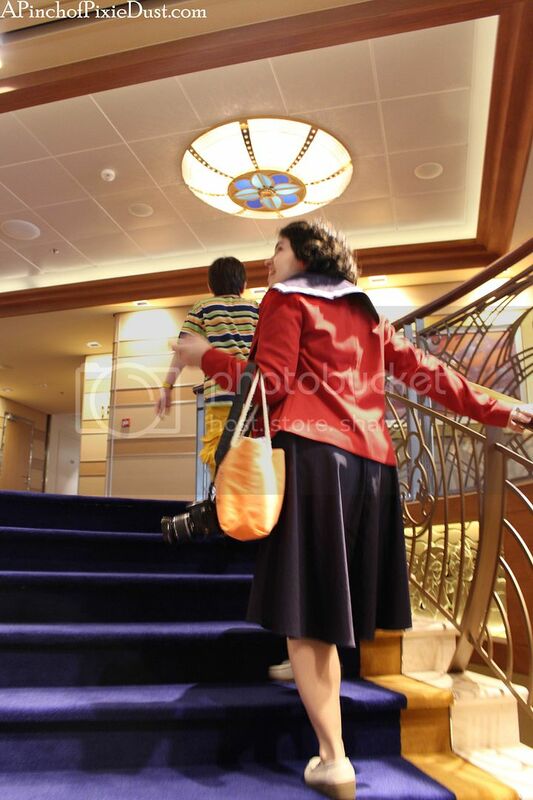 If you board the ship as early as possible on the first day (like we did! 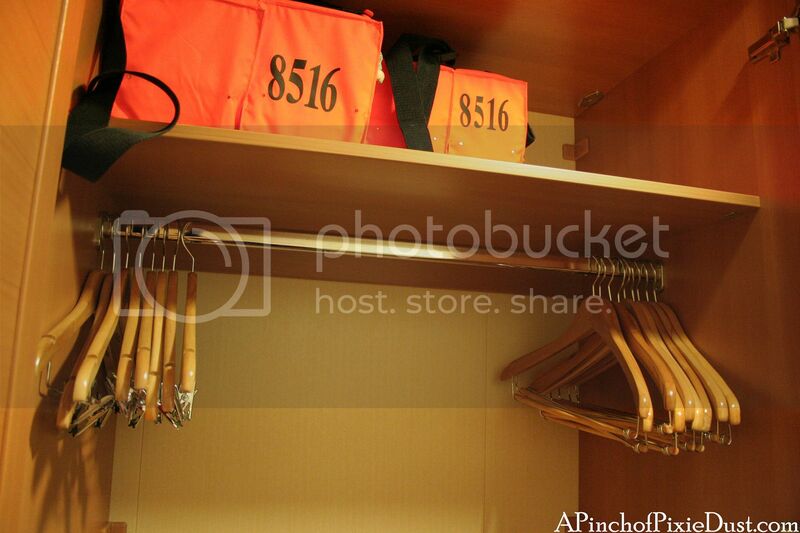 ), your stateroom might not be ready immediately. We went to lunch at the Enchanted Garden and did some exploring first...when we went to the cabin at 1:30, it was ready! Our cabin was on deck eight near the aft (or rear) of the ship. 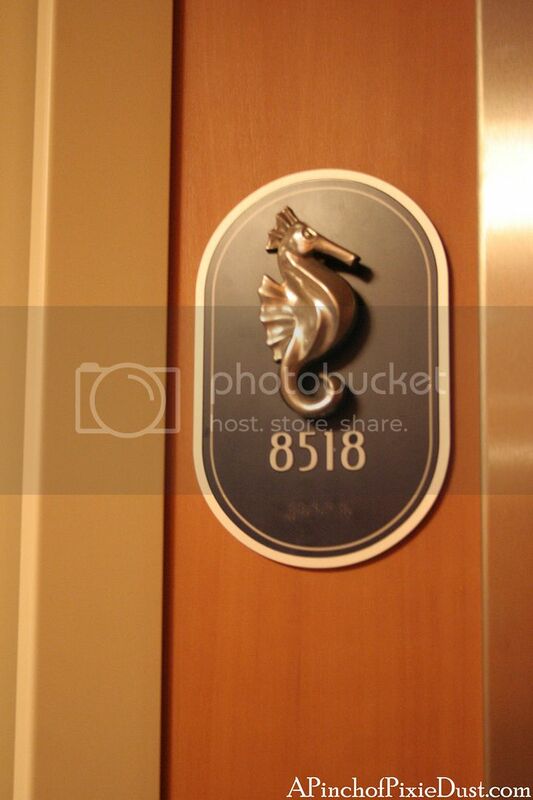 The fish is the famous face usually next to your Disney Cruise door, but we actually had a seahorse this time! I noticed there were fish on some of the other decks, though. 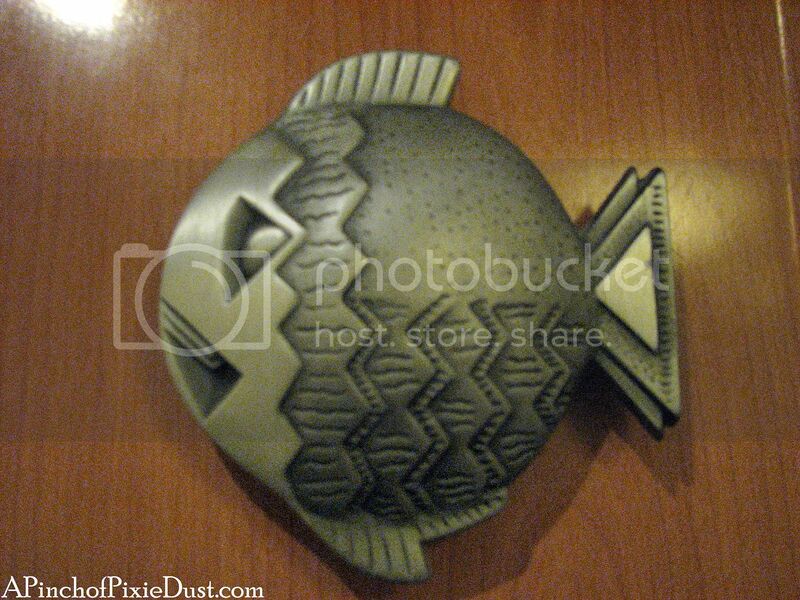 Mama Snob found a cute fish keychain in the gift shop...I liked the seahorse too, I wish they'd had one of him! 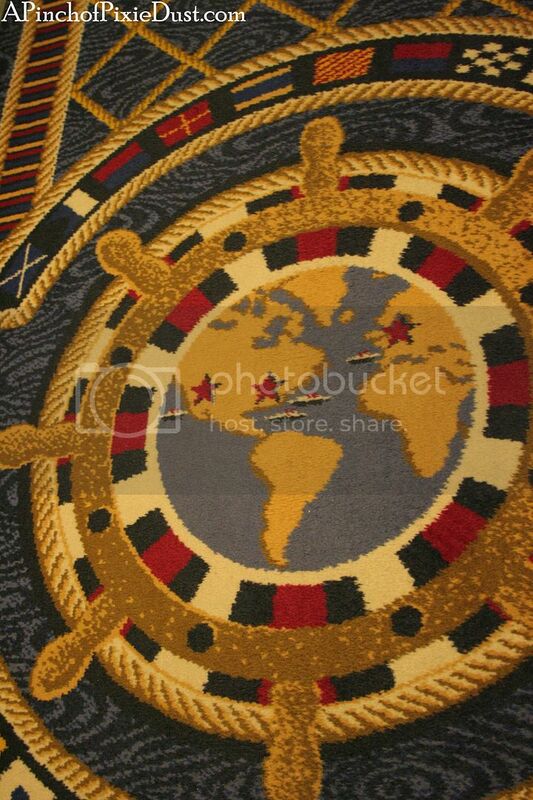 I LOVED the carpet - it's a worldview of different Disney Cruise ships and destinations! 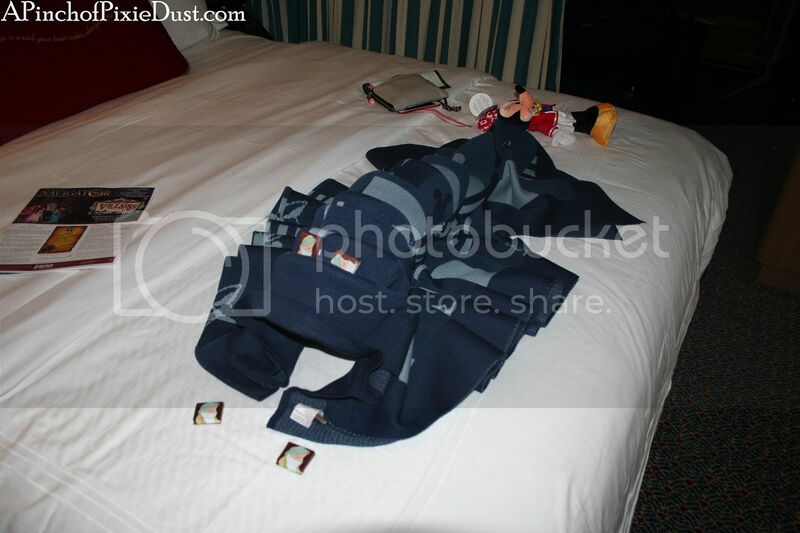 If you've been on a Disney Cruise before, you're in the Castaway Club and you'll find some simple little presents waiting in your stateroom. 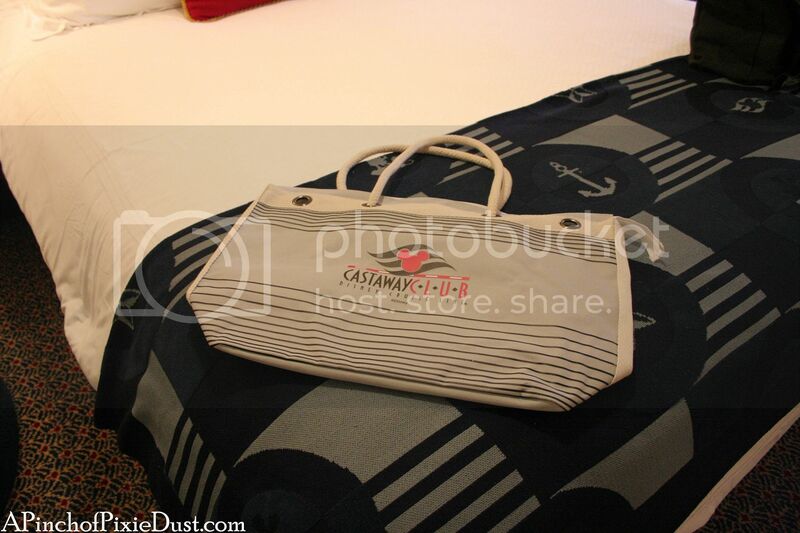 I did love the bag we got - so cute! And so handy, because by the end of the cruise you will probably have picked up some souvenirs... ;) I just wish it was more sturdily made...those rope handles pop out of the holes really easily. 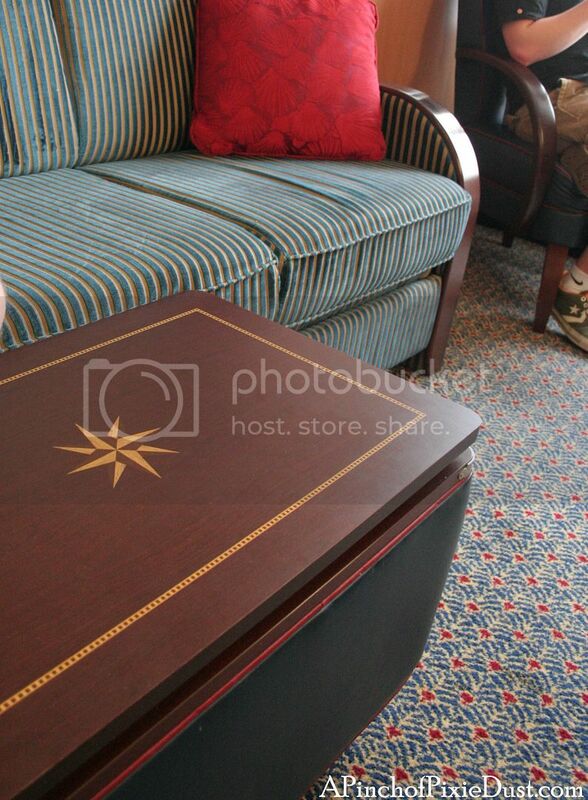 Let's take a look around the stateroom, shall we? 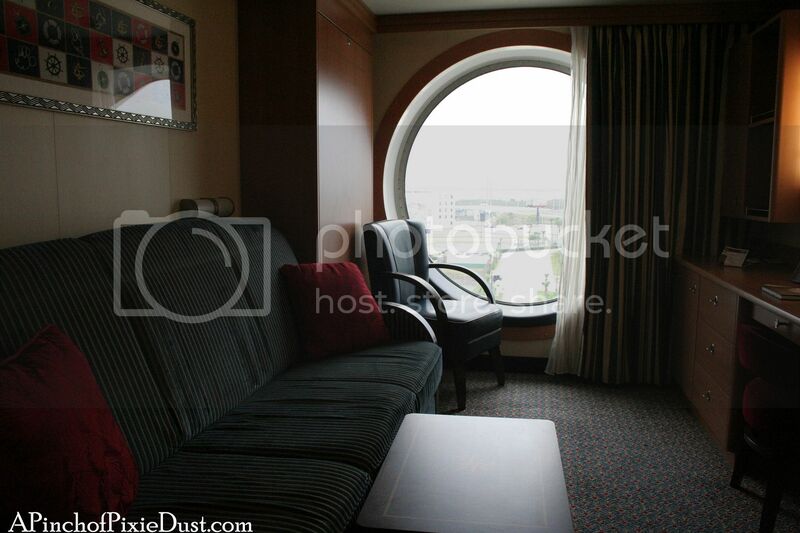 This photo was taken from the end of the room, looking back towards the door. 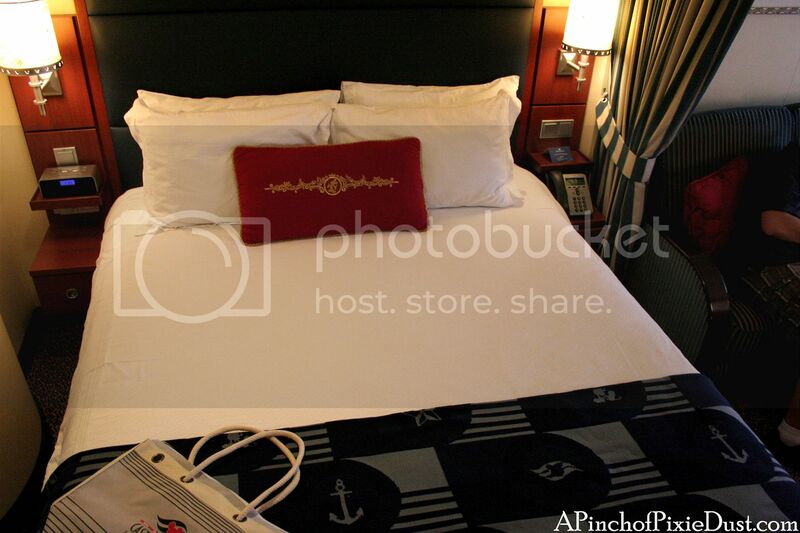 Each stateroom sleeps four people, so with my big family, we got two connecting staterooms - you can see the white connecting door propped open there. 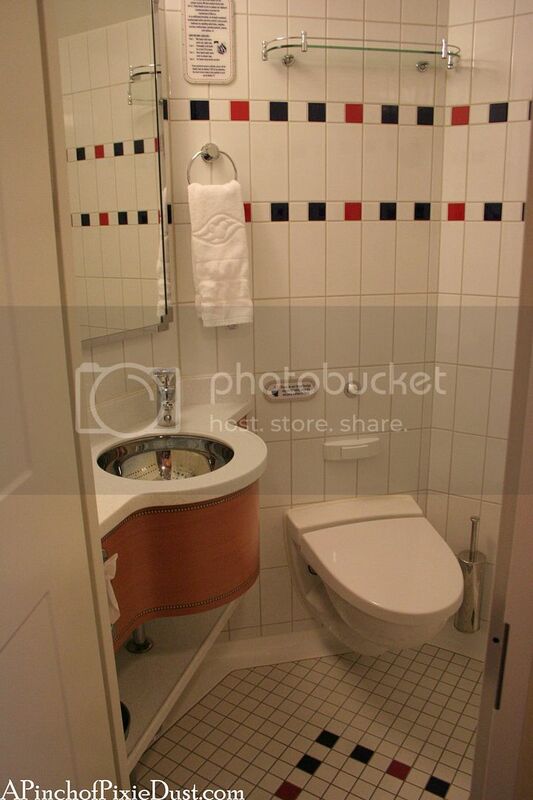 One room (far left photo) has a sink and toilet. 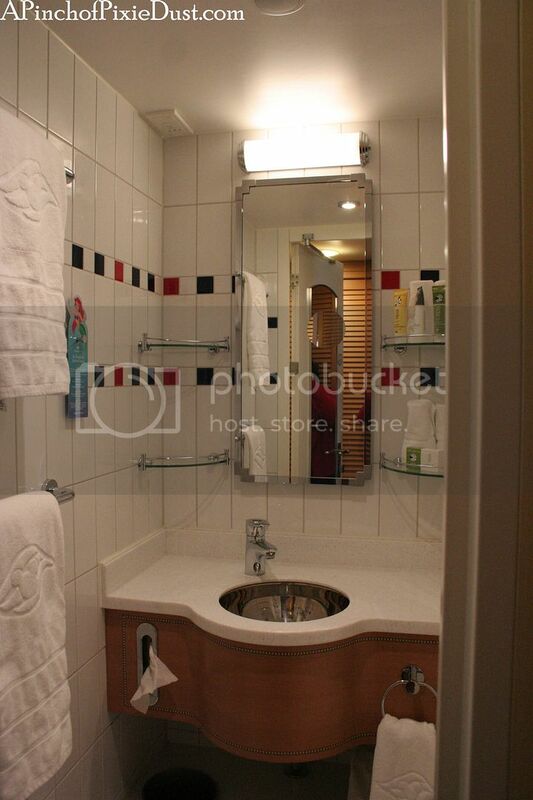 The other room (two right photos) had another sink and the shower. 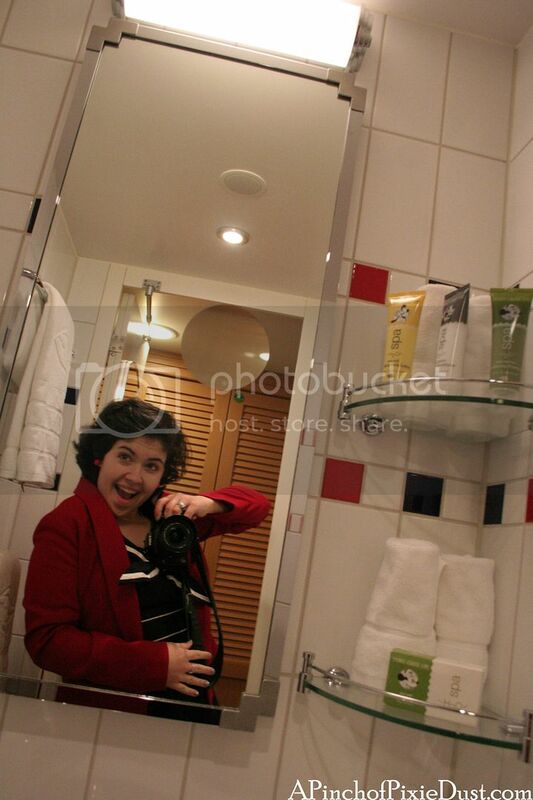 It was a fairly goodish-sized restroom area for a cruise ship. It felt a little cramped of course but not as bad as you might imagine. 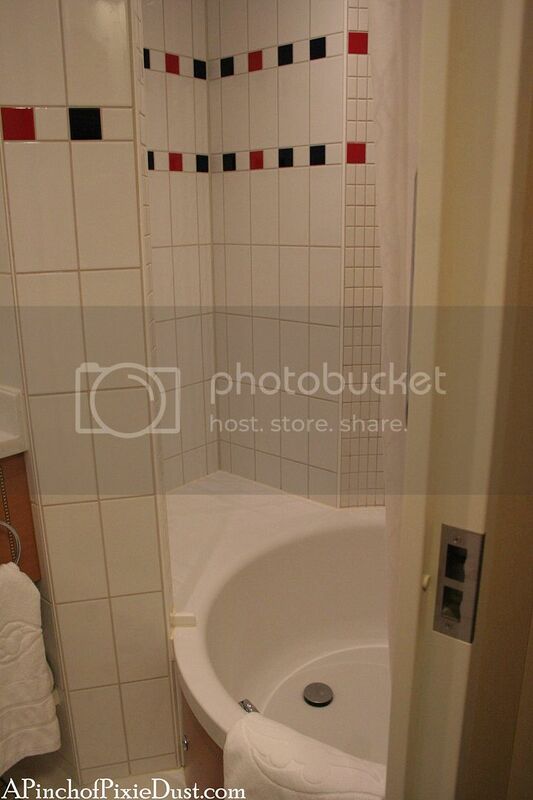 The shower was quite nice and had a shallow round tub. 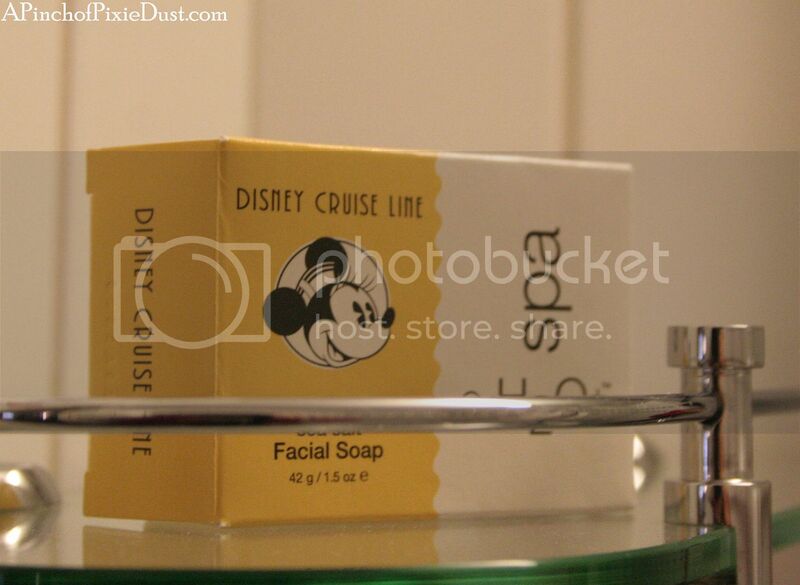 There were Disney Cruise Line toiletries too! 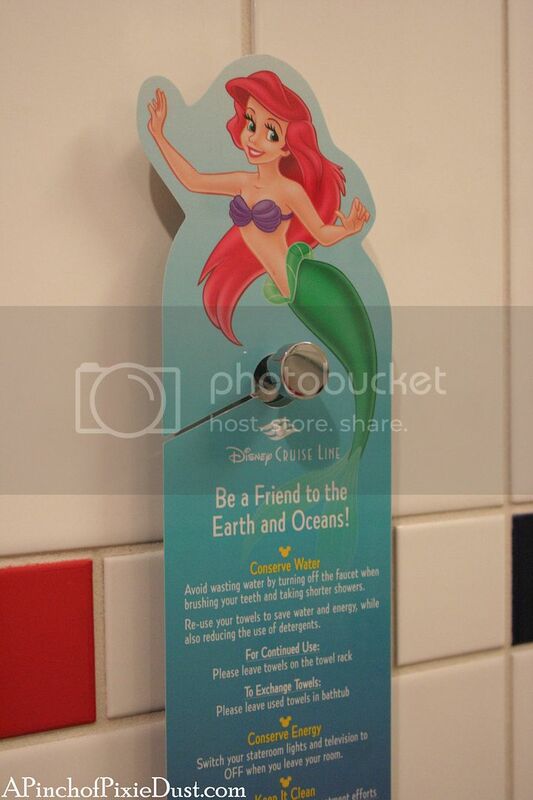 I bet that Ariel sign often disappears in a scrapbooker's cabin. 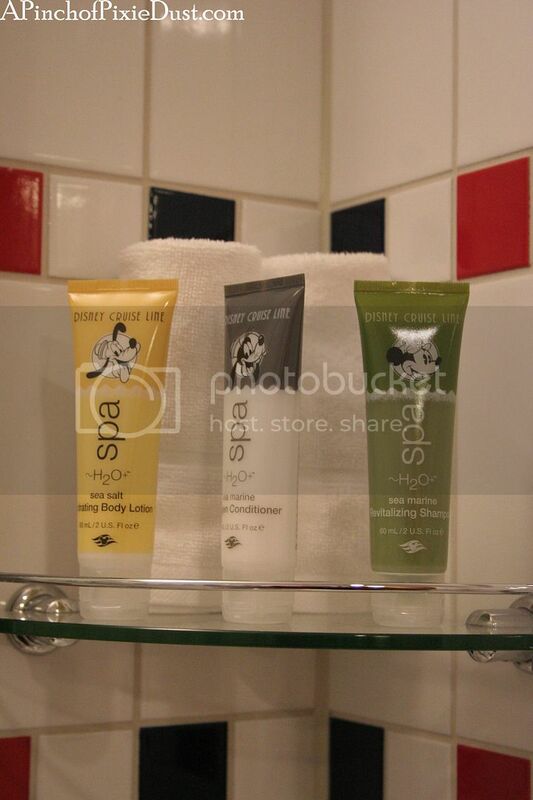 ;) And I definitely snagged some body lotion to take home. Whenever I use it I smell like the cruise! Disney mirror selfies are always necessary. 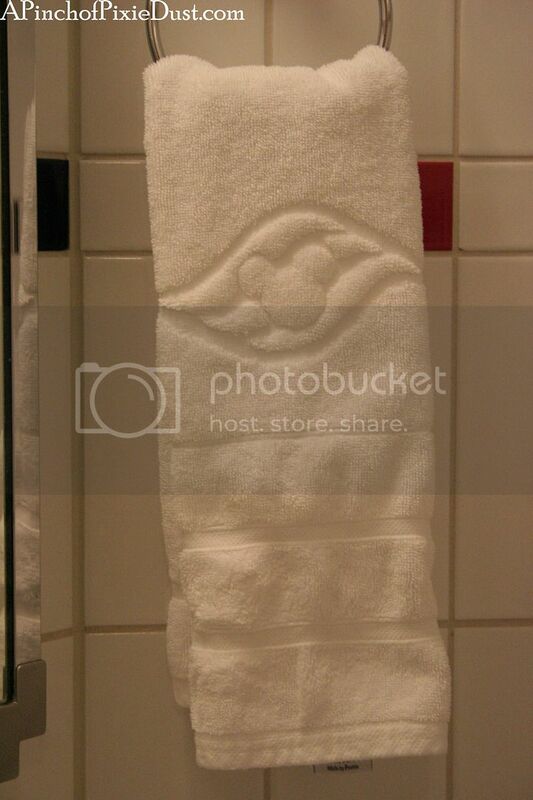 And it's not a towel mickey, but there's a Mickey on that towel! 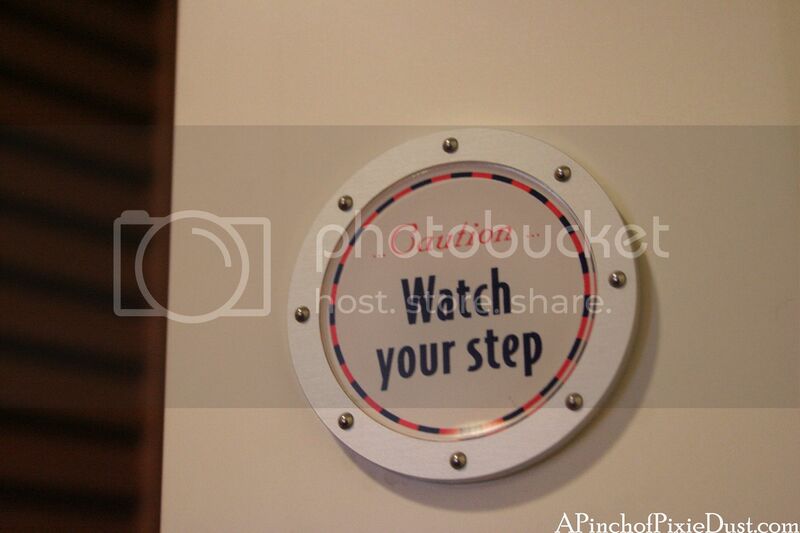 'Watch your step!' 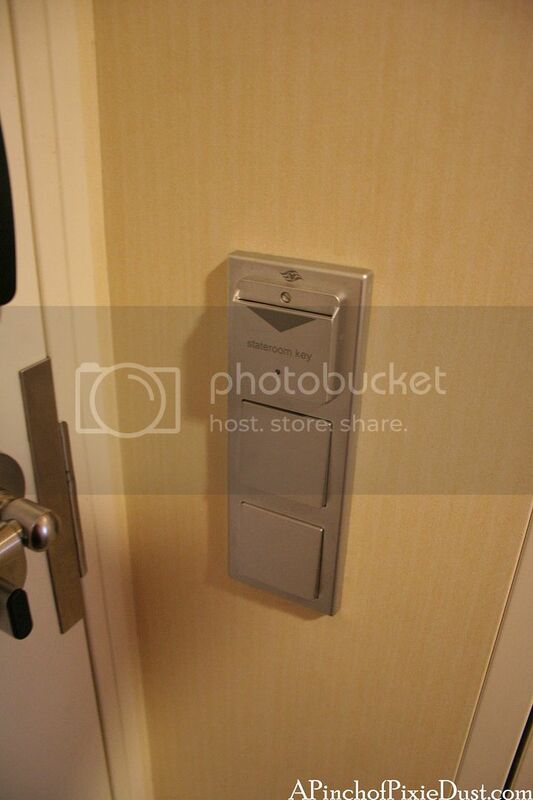 There's a small step up and down getting into the two bathrooms. It was nice to have two separate spaces and two sinks for getting ready in the morning! One night it was a lobster! 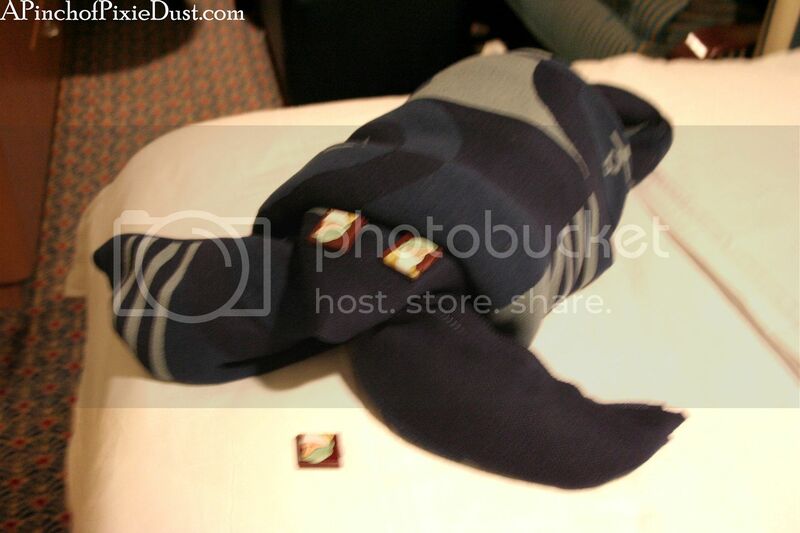 There were also frogs and sea turtles - with "Sleepy" pillow mints as eyes! 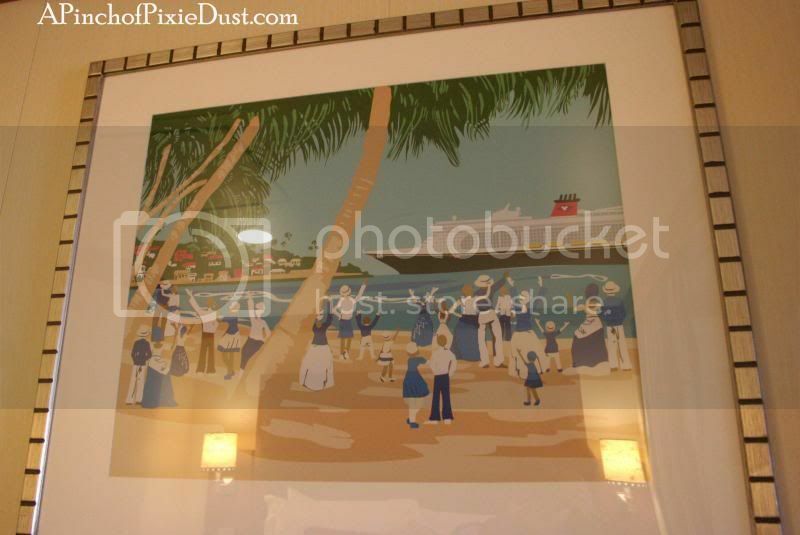 The artwork was art deco and made you very excited for your ocean journey - just look at those gleaming cruise ships! 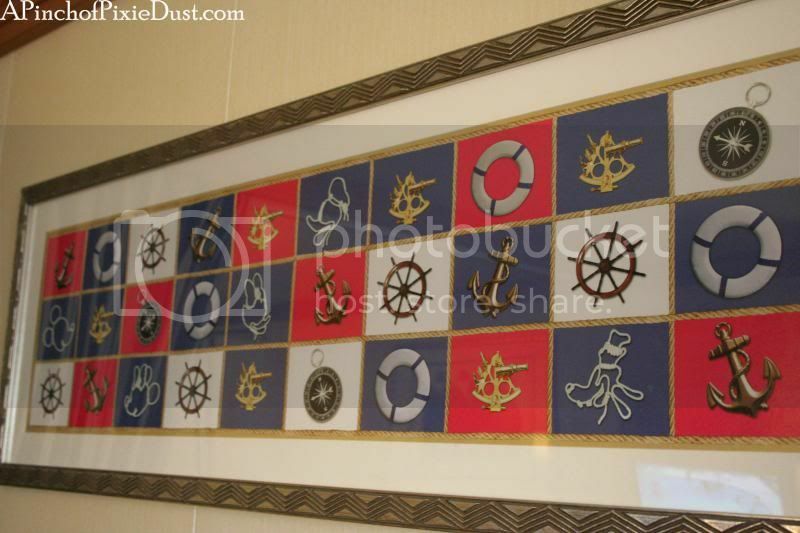 Over the couch there were more nautical symbols and some character rope profiles! ...also a few from the Artistocats! There was a cheerful Bahamas scene too. 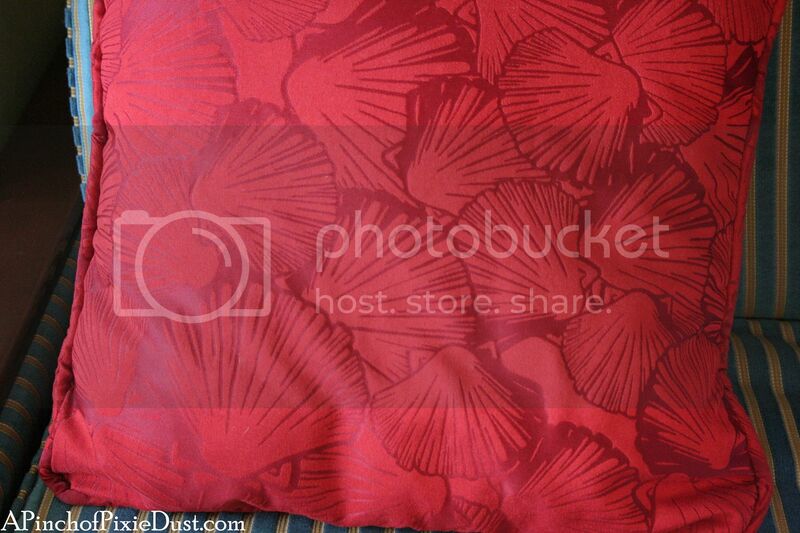 This pillow didn't have a Mickey, but I did like the seashells. Beyond the queen bed was the desk area. 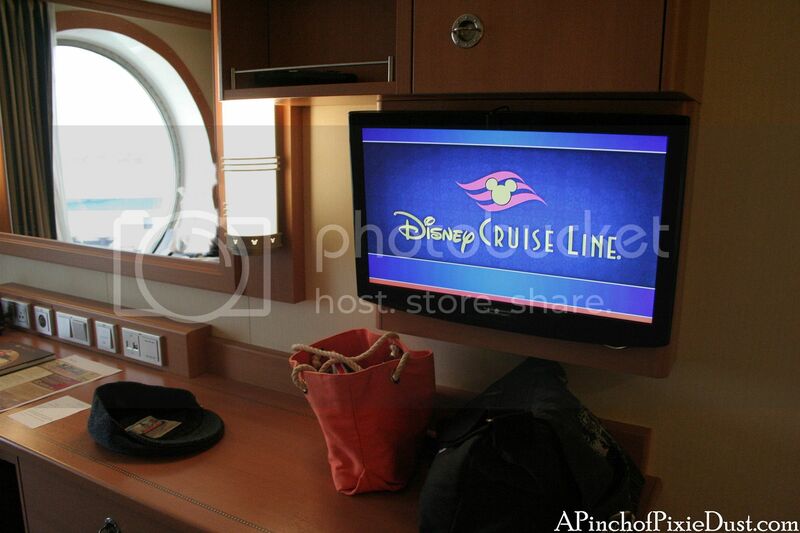 The tv could be turned to face either the bed or the couch, and had all sorts of neat channels - you could watch the broadway-style shows each night from your stateroom (pre-taped rather than live), and there was a huge array of old Disney movies. My brothers were determined to watch Darby O'Gill and the Little People. I don't even know. This was the chair at the desk. I wanted to take it home with me. So stylish! 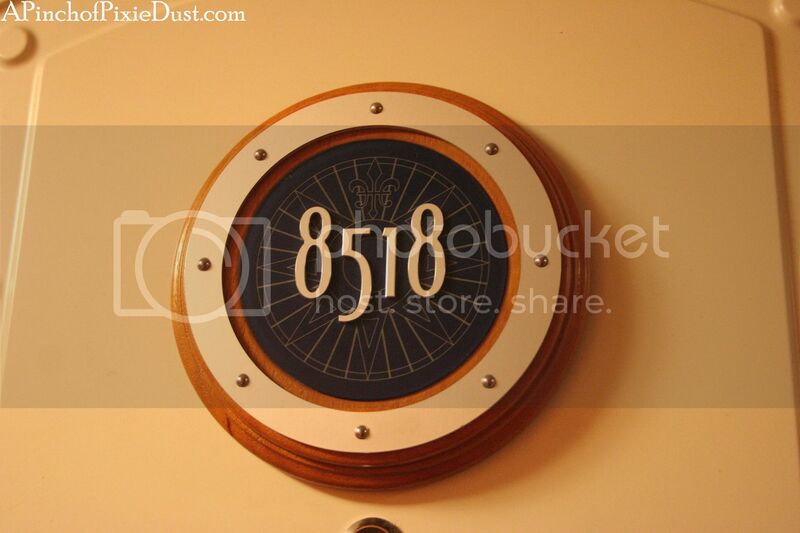 I also would have liked to take the porthole home with me, but that probably would have been even more of a problem...lol! 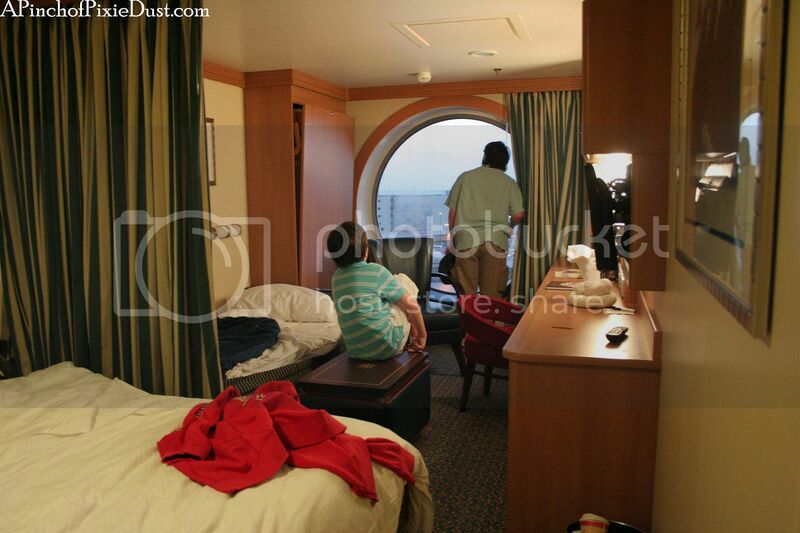 The porthole is HUGE and even has a cozy padded seat in it. It made the room feel so much bigger! You could climb into the porthole, shut the curtains on yourself, and it was just you and the sea. 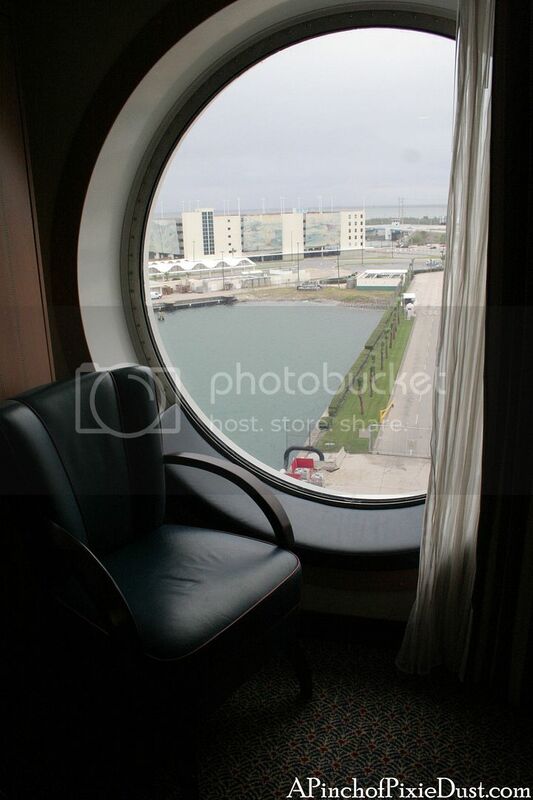 The fold-down Murphy Bed was just next to the porthole, so when I woke up the second morning of the cruise I could see the Bahamas moving past out the window as we pulled into Nassau...perfection! 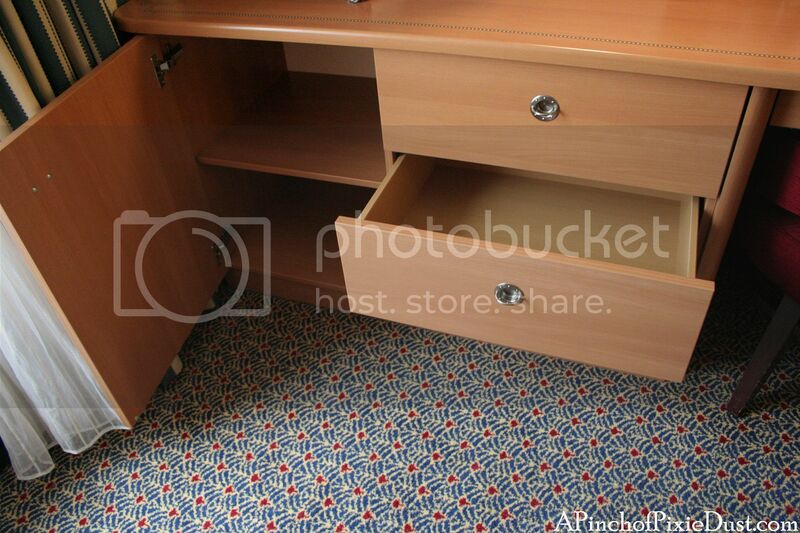 For a relatively small space, there was plenty of storage to get your stuff out of the way - drawers and cupboards beneath and above the desk. The ottoman had a compartment inside too. 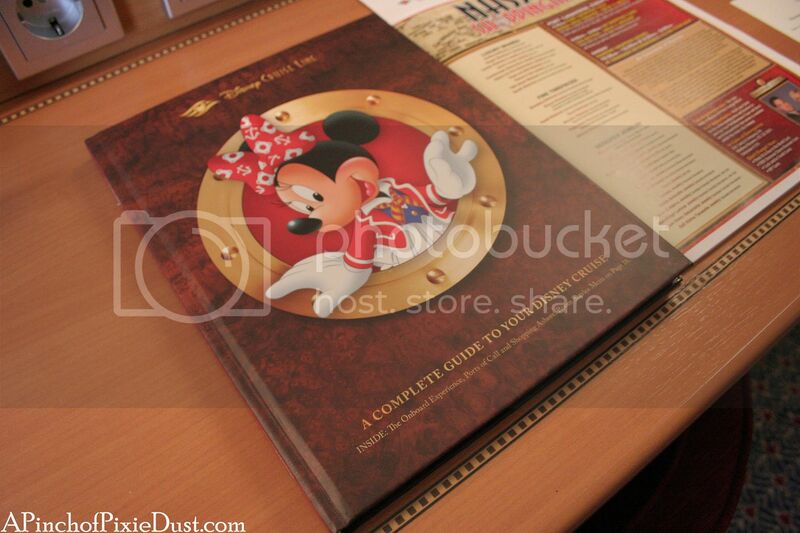 Cruise Director Minnie Mouse was on the outside of the information book! The wave phones were on the desk as well. 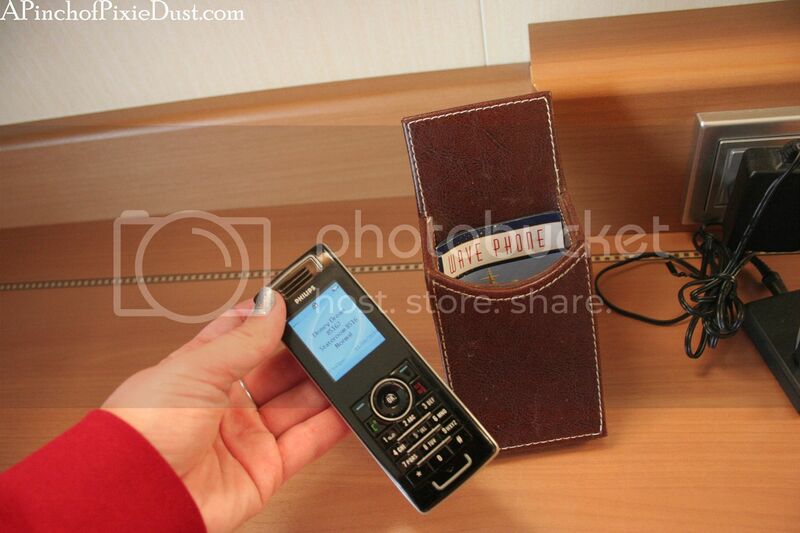 Each stateroom is provided with two for complimentary use on the ship - they're basically cell phones. Since you probably won't have cell service and the wifi costs an arm and a leg, the wave phones were perfect for keeping in touch. 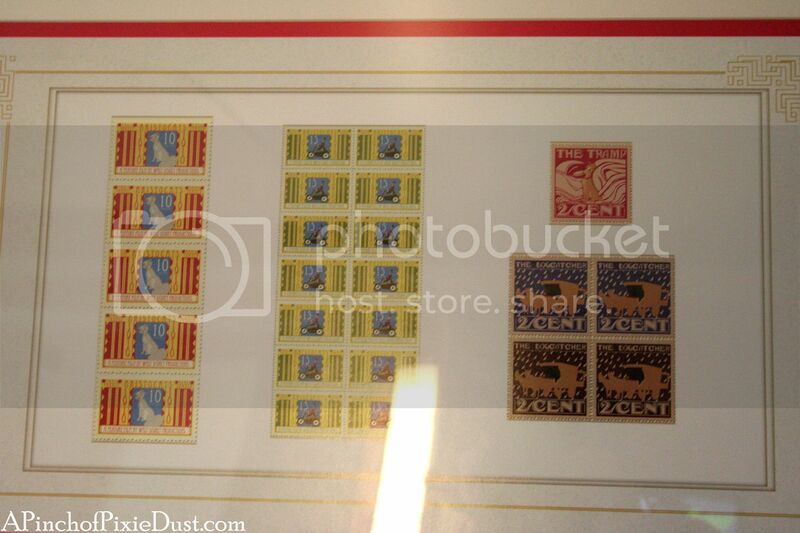 You just had to keep careful track of them - if you lost one you'd be charged something like $200! 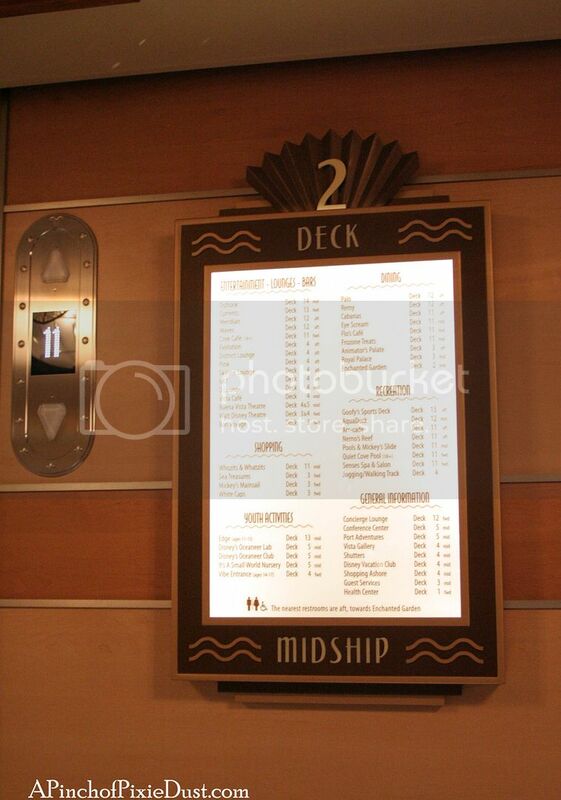 Are you setting sail on a Disney Cruise anytime soon? 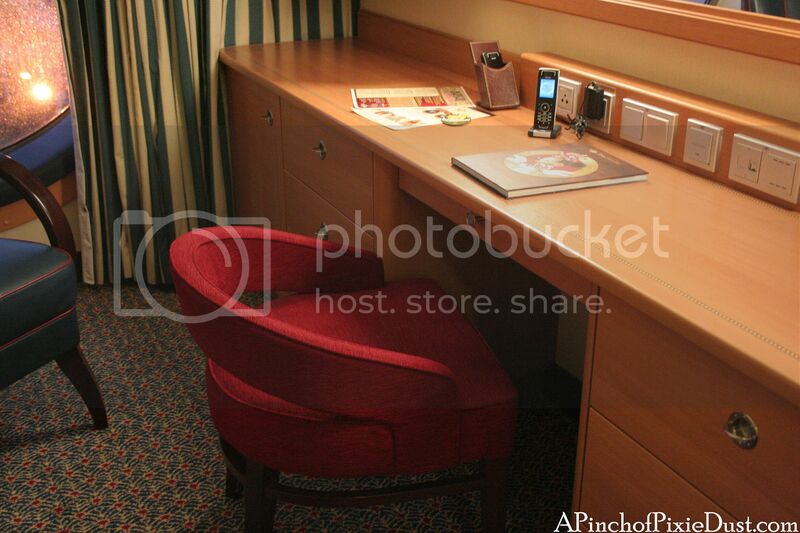 Which type of stateroom would you book? 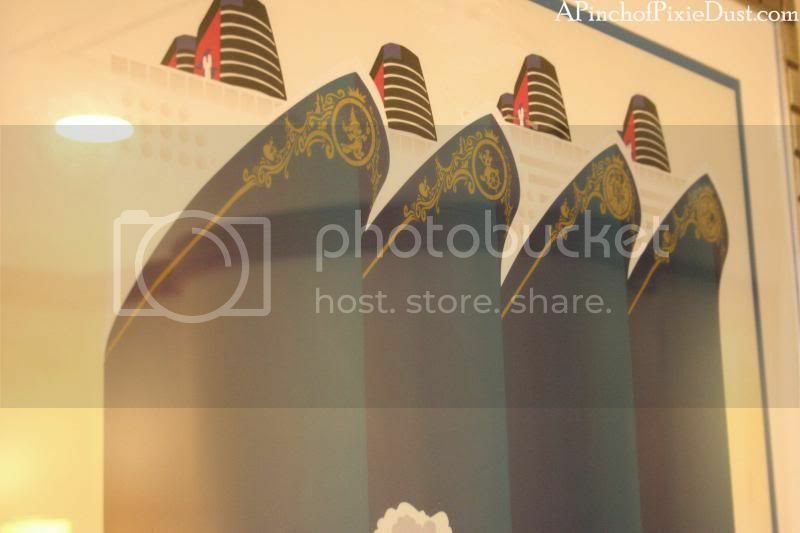 I was so happy to see this post today- I'm planning my very first DCL vacation, and I've been wondering about the cabin details! 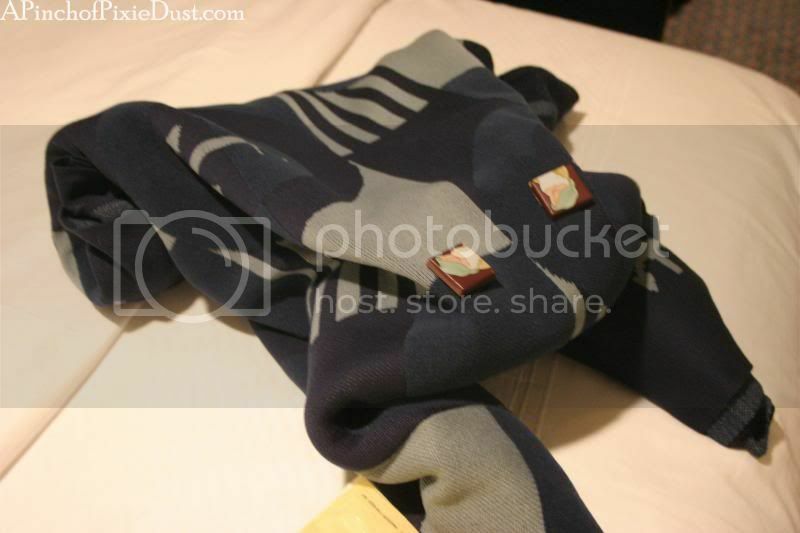 I love those blanket animals- I haven't seen that before! 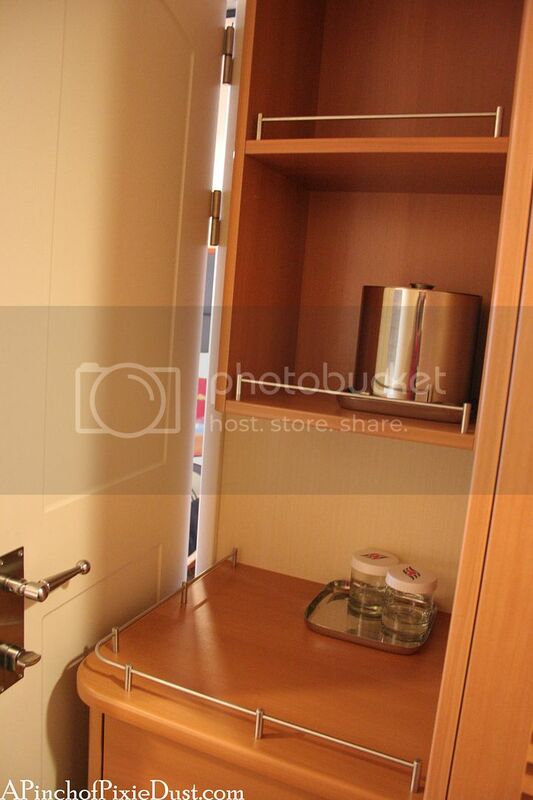 Is there space to stash our suitcases? We'll be at WDW a few days before & after the cruise, so we're likely looking at three full size suitcases. Is there room in the closet or perhaps under the bed? Thanks! No cruises in my future, but I did get to go on a DCL AEP (Agent Education Program) in March on the re-imagined Disney Magic. What a beautiful ship! 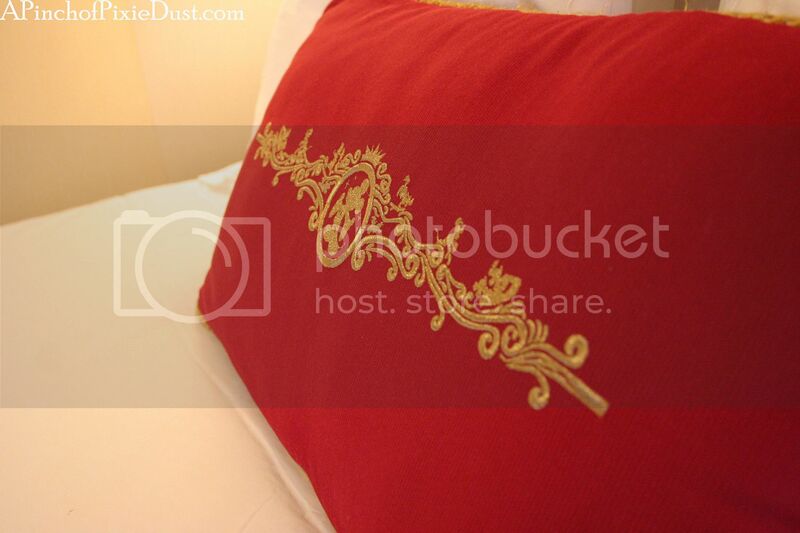 We stayed in a Deluxe Oceanview Stateroom with Veradah. I am so spoiled now! I loved going out on the verandah early in the morning and watching the sunrise & smelling the sea. 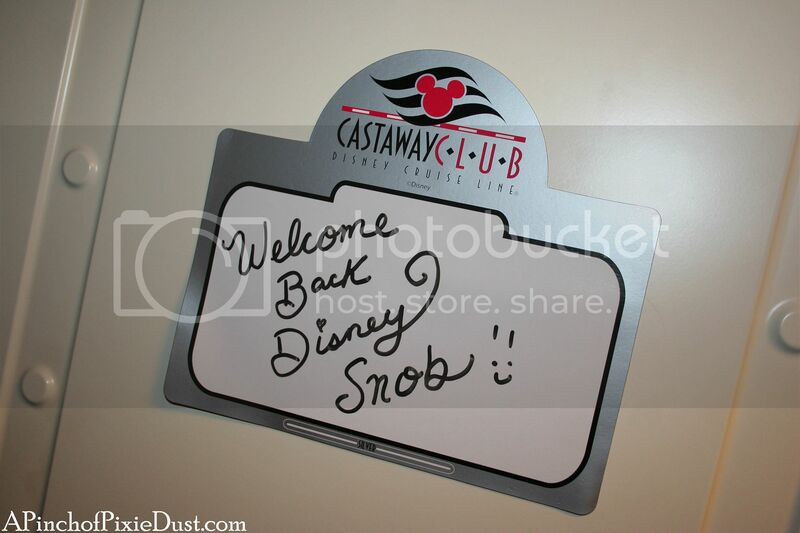 We even got to watch us back into Castaway Cay. Very cool! 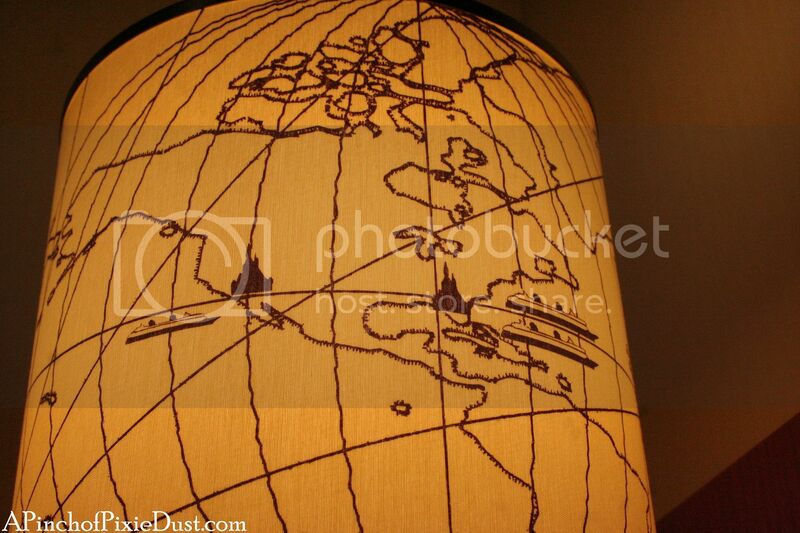 I adore the lampshades with the cruise ships on them. What a great detail. 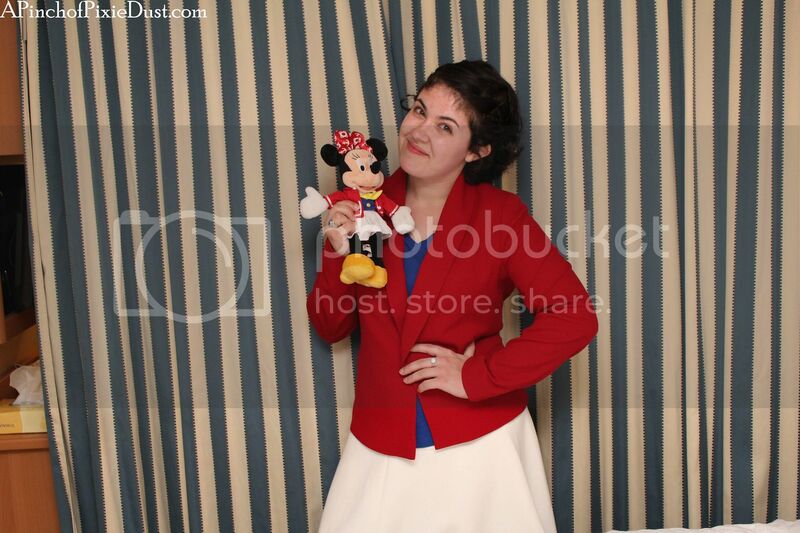 I also loved the black & white picture of Walt & Lillian Disney onboard a cruise ship holding a stuffed Mickey. AH! 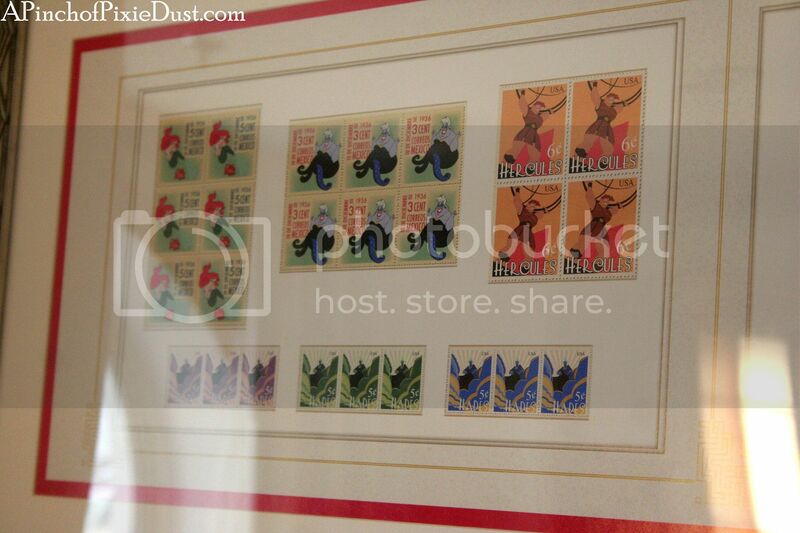 :) Above our sofa was "When you Wish Upon a Star" in music notes. I made sure to take home the lotion from the bathroom and a friend of mine who is allergic to lotion just gave me 3 more the other day from her cruise. I am set for awhile! Great review!! I do love the Balcony rooms; it's so nice to be able to sit out there in the morning with your coffee or tea, or crack the door at night if you want to hear the ocean and smell the sea breeze....bliss!